Home » ABS-CBN , Bukas Na Lang Kita Mamahalin , Dawn Zulueta , Gerald Anderson , Kapamilya , Maja Salvador , news » What was Gerald Anderson’s earnest wish on his birthday? 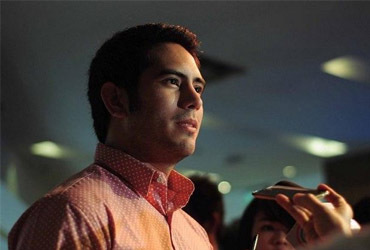 What was Gerald Anderson’s earnest wish on his birthday? Gerald Anderson is excited for his upcoming teleserye “Bukas Na Lang Kita Mamahalin” as he said it’s a unique soap compared to “Budoy”. “Tuloy-tuloy po ang taping namin tapos sobrang excited na rin kami. Excited kami [sa] show na ito na mapalabas para mapanood ng mga tao kasi iba naman siya, iba siya sa Budoy,” said Gerald, in reference to his previous teleserye. The actor had worked before with Dawn Zulueta in a movie project and now in this teleserye, when he was asked about his thoughts about Dawn, he said, “Sobrang bait, sobrang swerte namin na si Miss Dawn ang nakasama namin sa cast namin.” shares Gerald. With all the issues that stretched the media regarding his rumored relationship with Maja, the actor has been asked if he is ready to face a challenging year, “There’s always a rainbow after the storm, Kailangan lang maging positive. Siyempre kasama talaga ‘yan, eh. Kung di ka magiging strong, dun magiging mahirap, so you should stay strong.” said Anderson. He also stressed that although sometimes problems come in one’s life, but he is happy because these problems also bring opportunities for a person to find out what he really is made of. “Tulad ng sinabi ko dati, dun natin malalaman kung sino talaga tayo. Hindi sa panahon na successful tayo o nasa taas tayo, kundi dun sa mga panahon na marami tayong problema. May mga pinagdadaanan tayo pero I’m very happy right now,” he said. Is Gerald has something missing in his life that he wishes to get? He replied, “Siyempre, wala namang buhay na kumpleto, di ba? Pwede tayong maging kuntento at masaya kung ano’ng meron tayo ngayon, pero syempre sa ngayon, bata pa naman ako, andami ko pang gustong gawin.” shares the actor. Gerald has been told as a generous type of guy who shares his blessings to someone special, the actor’s reaction was, “Shina-shower ako ni Papa God ng maraming blessings, gusto ko rin gawin ‘yon para sa mga malalapit sa akin,” he said. Rumors say that the actor gave a valentine gift to Maja where he rented a helicopter that took him and the actress to a luxurious restaurant in Tagaytay, but Gerald’s response was only a smile, and said that he is happy now with his life.